Description: Subject is a human mercenary who bonded with one of the 16 experimental units that the Creators brought to Earth. This particular unit is even bigger than a Guyver Gigantic. Not much is known about the host but this unit has shown itself powerful enough to kill even Hyper Class 2 type Zoanoids with a single blow. – Strength is roughly equal to the Warrior Class unit, it’s power punch, similar to the Guyver Gigantic, is extremely powerful. 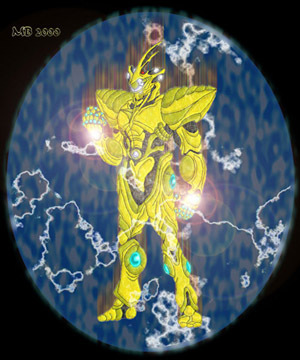 In a manner similar to the Guyver Gigantic, the Giant Unit can produce a single punch that is roughly equal to the destructive power of a 0.4 kiloton explosion. – Speed: Ground speed = 0 – 450 MPH ; Flight Speed = 0 – 3000 MPH and a boosted max of 4800 MPH. Reflex Speed ranges from 10 to 100 times normal. Power Punch acceleration is equal to 10 G’s, and allows subject to reach his maximum speed in five seconds flat. – Durability is twice that of a Gigantic, thanks to a more powerful shield system, but has no body or control medal shielding, and is unable to adapt to substances like the enzyme blood. – The head beam is about equal to the four times that of a normal Guyvers. – Pressure Cannon is equal to a third of a Gigantic Guyvers but the power is channeled through fist when subject performs a power punch and is part of the reason the attack is so powerful. – The megasmashers are only equal to a normal Guyvers megasmashers. – Subject has no high freqeuncy swords, instead vibrational energies are channeled through fists for added impact effect when performing a power punch attack. – The units control medal is only made up of 1 outer metal ring, and the center is composed of biomaterial like the armor. The importantence of this has yet to be determined. – Subject also has a powerful beam weapon enclosed within the Units shoulders. When activated the shoulders open up to reveal Mega Smasher like cells but with significantly greater capacity. Allowing subject to fire a directed blast three times greater than a normal Guyvers Mega Smashers. When combined with subjects chest Mega Smashers, the total destructive energy easily rivals the full quadruple cell blast from a Grakken.